There's 1 week to go. I won the opener against my Spanish opponent but had to come from behind in time-pressure. (7. e5 $142) Nc6 8. Qe2 Na5 9. Bd3 (9. e5 $142) e5 10. Rd1 Bg4 11. h3 Bxf3 12. P.S. - Happy Thanksgiving to all my readers! 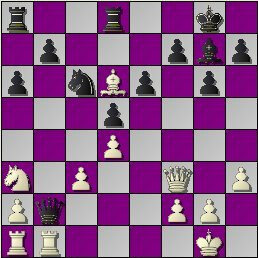 $14) 14... f5 $4 (14... Kf8) 15. exf6+ Qxf6 16. Nh3 $4 (16. hxg5 $18) 16... Rxh4 17. 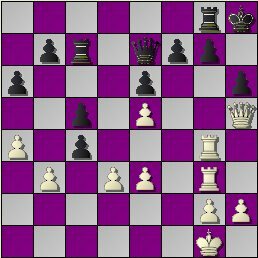 Qg3 e5 $4 (17... Kh8 $19) 18. dxe5 Qxe5 19. Rd5 Qxg3 20. fxg3 Rxh3 $8 21. Mark Kernighan, Ian Mangion & Don Carrelli tied for 1st place at the KCC's Fischer Random tourney. Mangion beat Kernighan in round 3 to take the lead but lost to Carrelli in the final round. Ziggy Bliznikas finished 4th. A crosstable will follow at some point. Tonight, in the STC Gauntlet's 3rd round, I have Black against a 1751-rated Argentinean. The game is scheduled for 7:00 EST on FICS. Hope it goes better than my last 5 STC blacks (+0-3=2). The next game will be Friday or Saturday, probably at the same time. Geoff McAuliffe was kind enough to annotate his recent loss vs. Lev Zilbermints for my blog and Philidor Counter-Gambit detractors. Replay it here and re-download the Roselle-Kenilworth PGN to update your files. At 8:15, Don will explain the rules and, IMO, most importantly, show how to castle in this variant. So, arrive early. Positions will be generated on-site (with Fritz, I presume) before each round and posted on a demo board. In last night's consultation game at Kenilworth, the White team led by experts David Grasso & Mark Bilenky defeated a Black squad headed by KCC Champion NM Mark Kernighan & U1800 titleist Ian Mangion. 27 players participated. 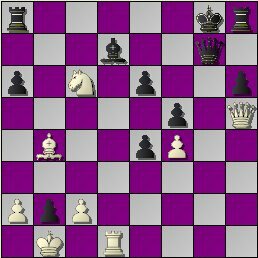 It was an exciting contest with both sides in deep time-trouble over the last 16 moves and a terrific tactical conclusion where the victorious side sacked 2 Exchanges! ... fully annotated java-replay page & zipped PGN. P.S. - Next time we'll have a time control every 10 moves to avoid the time scrambles. My first game in the STC Gauntlet's 2nd round is tonight at 8:15 p.m on FICS. I'll be playing a late-joining, 1739-rated from Utah. If you aren't a Free Internet Chess Server member & want to watch, just download, install & run an interface (BabasChess & Thief are good. More choices here), logon as a guest (or first register) and "follow jmoldovan". When the game is over, I'll insert the replay link & paste the PGN. On Friday night at 8:15 p.m., I have Black against the same opponent. Further Update - Fri. 11/14 at 9:00 p.m.
My opponent didn't show. So, I claimed a forfeit win. The Kenilworth Chess Club will be having another Consultation Game this Thursday night (Nov. 13th). We'll start at 8:30 p.m. Hope you can be there. It's a great exercise. In the past few weeks, the idea of a NJ club-based chess league has been tossed around. The West Orange, Dumont, Kenilworth and Newark Sleepless Knights clubs have all expressed interest in joining and I believe it is time for the above and other potential parties to meet, fully discuss the details (such as team size, rating limits & venues) and open a schedule-window for 2009. This pow-wow could take place at the KCC on Thursday, December 4th at 8 p.m., Springfield's Checkmate Club, the WOCC or some place else but, IMO, it should be before the end of the year. 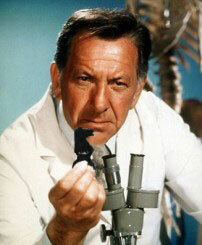 Waiting until the USATE in February would be too late as most clubs would have already formed a slate of events. Comments on this post would be very welcome. In their biggest & final match of 2008, the KCC lost to a very strong Roselle team last night, 10.5-4.5. Joe Demetrick, Max Sherer & Mike Wojcio scored full points for Kenilworth while Mark Kernighan, Mark Bilenky & Eugene Shapiro notched draws. The board-by-board results & a few games will be posted Saturday. On Friday (1 p.m. EST on FICS), I'll have Black against the same opponent. P.S. - To enhance my chances, notes will not be posted during the event. Roselle’s players are listed on the left. Kenilworth will have white ■ on the even-mumbered boards. ** - If Gomez can play, he & McCorkell will choose for color on #15. Otherwise, it’ll be a 14-board match. 23 people attended Scott Massey's "Exchanging Pieces" lecture on October 23rd. Of the 8 games illustrated, the speaker's 1984 Gurgenidze/CK Exchange win over fellow NM Edgar McCormick was most enjoyable. IMO, it alone was worth the price of admission! Here's an annotated replay page & PGN file with that contest & all the others. A supplemental posting or file will likely follow. The entry-deadline for the 2008 STC Gauntlet, a 60+15 match-tourney on ICC, FICS & WCL, is tomorrow (Sun. 11/2) at 4 p.m. EST (21:00 GMT). Late-joins will be accepted until the start of round 2.